Seems like there’s a lack of bold and beautiful girls in Pakistan “OR” our girls find Pakistani men superior than our own countrymen. Now whatever the situation may be, it’s not good. Not yet over with the saga of Ayesha-Sania and Shoaib, and here comes the news of another affair blooming between Bollywood and Pakistan cricketer. As we all know Pakistan cricket legend Wasim Akram and actress Sushmita Sen hosted Ek Khiladi Ek Haseena, a reality show together on television around two years ago, now rumours are that they are seeing each other. 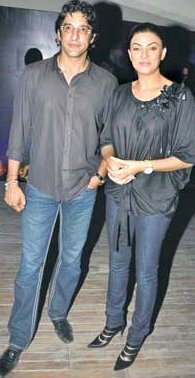 On Monday night, Wasim and Sushmita were spotted at a suburban nightspot spending evening in each other’s company, the first time they’ve made a public statement about their togetherness. Incidentally, a couple of Bollywood celebrities including Shekhar Suman and Aseem Merchant were also present when Wasim and Sushmita made their entry. Wasim was happily married to Huma, but after her untimely demise in October last year, the rumours of Sush and Wasim started growing stronger. So he is not cheating on his wife and Sush is also single right now. Whatever happens to their relationship, just wish they don’t get into a telephonic Nikaah! Roving eyes of our young cricketers!